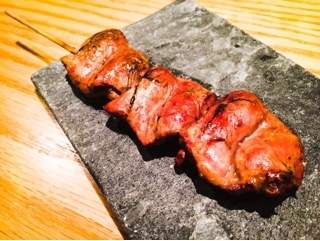 If you’re a grazer and fancy eating small portions of food while drinking, Kintori Yakitori is an idyllic dining experience. 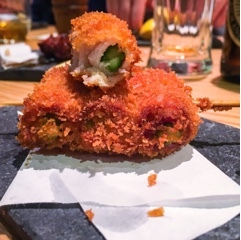 Think of the restaurant as the Bar Raval of the Japanese scene – order a few items (most dishes are sold in single units), chat whilst enjoying a drink, then order some more. Repeat until you’re full and satisfied. 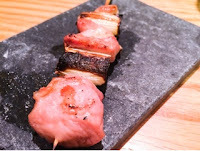 As Kintori’s name would imply, yakitori is what their known for – in the strictest sense, skewered grilled chicken products. 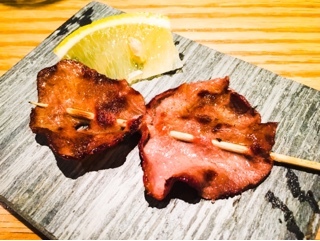 In reality, the restaurant’s menu encompasses many other proteins and vegetarian ingredients as well. 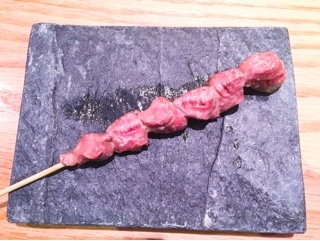 The gyu-tongue kushi ($3.80) was fantastic, a thin slice of flavorful tender beef with a slight springy bite. The dish offers such a rich flavour in a delicate way. We tried two meat and onion options. The grilled spring onions interlaced with the chicken thigh in the negima ($1.80) provides a slightly sweet and fresh contrast. 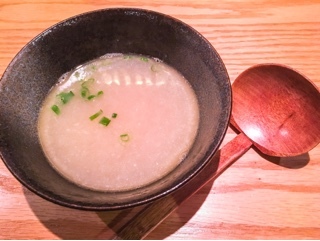 While the scallion sauce covering the beef ($3.20; negi shio gyu) was much stronger – if you enjoy the ginger and onion oil that accompanies Chinese boiled chicken, this is very similar. 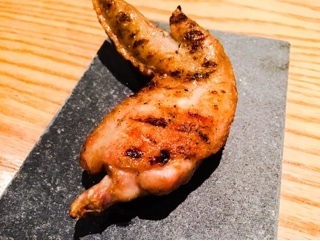 The chicken wing ($1.80; tebasaki) was delicious, especially in the winter when the craving for BBQ starts to creep in. Of all the meats, this had the most prominent hint of smokiness, the end product of cooking the yakitori over Binchotan charcoal that Kintori imports from Japan. 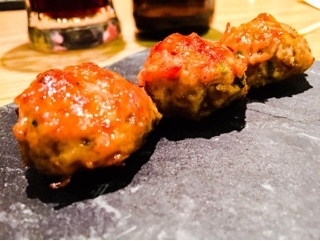 Although chicken meatballs ($1.80; tsukune) sound rather plain, the meat mixture was nicely seasoned and when combined with the caramelized glaze quite tasty. Kintori provided me with my first experience with numerous chicken innards ($1.80 each). 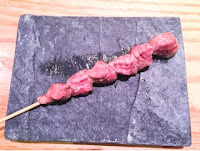 Despite the scary veiny looking exterior, the chicken heart (hatsu) was the best of the bunch and reminded me of a tougher gamier squab. The chicken gizzard (zuri) is what I like to think of as the bubble gum of the offal world; it’s good if you can stand the bouncy texture. 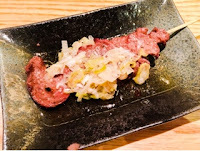 Despite having a delicious sweet and salty tare glaze on top, I regrettably couldn’t stomach the chicken liver (reba) – it’s quick change in texture becoming almost powdery and foamy is so different from the whipped mousse normally eaten. 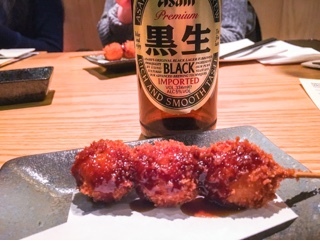 At times, Kintori also offers kushikatsu or skewered deep fried delights on a specials menu. The quail eggs ($2; uzura kushi age) and the bacon wrapped asparagus ($2.50) are heavier than the grilled options but has such a satisfying crunch from the panko crust. They went particularly well with beer, the malty bitterness of the Asahi black ($8) a nice combination with the grease. 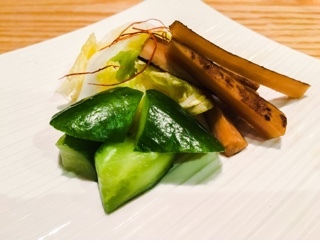 An order of the house made pickles ($3.80; oshinko moriwase) is a good idea, the lightly marinated burdock root, cucumbers and napa cabbage works to clean the palette. 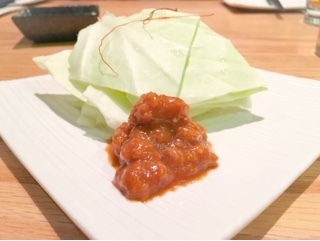 If you can stand the saltiness, the nikumiso kyabetsu ($3.80) could also work, the cabbage “salad” accompanied with a strong miso pork sauce for dipping. Should you need something more substantial, Kintori also offers noodle dishes including the ramen from Kinton downstairs. 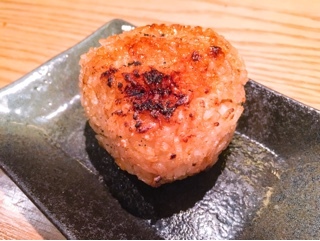 To keep with the grazing theme, we had the yakionigiri ($3), a grilled sticky rice ball with a smidge of preserved plum in the center providing a salty sour kick. I thoroughly enjoyed the crunchy smoky exterior, which reminded me of the crust that forms at the bottom of hot pot rice. For a savoury end, the delicate dashi maki ($5.30 for 6 pieces) is nice, the egg’s texture light and moist. 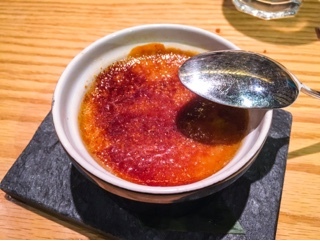 Meanwhile, if it’s sweetness you crave, the nouji cha crème brulee ($5) was also enjoyable. The roasted green tea taste was quite pronounced … I could see the matcha remnants on the bottom of the ramekin. With all the options, it may be difficult to decide what to order. 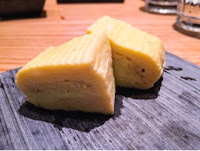 Kintori has an omakase ($17.80) menu where they’ll serve you a selection of what’s fresh and delicious. 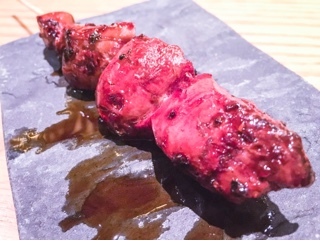 Considering Chef Hiroki Takai has been specializing in yakitori since he was 18, I’d say the restaurant knows a thing or two about what to try.